Wealth-transfer life insurance policies for differing objectives. Secure SuiteLife for guarantees...Growth SuiteLife for accumulation. Index-linked returns to S&P 500® and Multi-Asset, Risk-Controlled Index . Agents Earn extra Suite Cash on each $25,000+ sale! UnderWRITE-NOW ProcessingTM provides point-of-sale conditional approval for cases up to $250,000 - WATCH VIDEO! Fill out the form or call 800-852-7152 for more info! This material is not intended to provide investment advice to you or to your specific situation. EquiTrust does not offer investment advice to any individual and this material should not be construed as investment advice. Growth SuiteLife policies issued on Contract Form Series ICC17-ETL-FPIUL-2000(10-17) and ETL-FPIUL-2000(10-17). 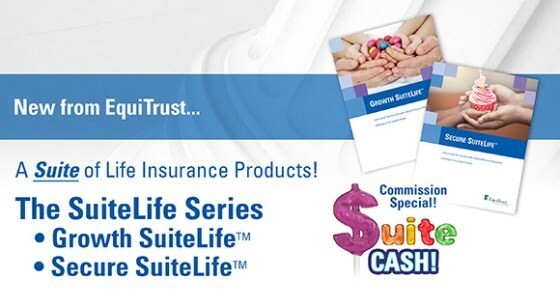 Secure SuiteLife policies issued on Contract Form Series ICC17-ETL-IUL-2000(01-17) and ETL-IUL-2000(01-17). May not be available in all states.